Meta Fab Incorporated is an innovative, quick turn, single point of contact metal processing faculty in Hillsboro, Oregon, delivering confidence to customers. Roger Jensen, the company's Lean Project Manager, was kind enough to share his team's experience of Kanban Tool with us. We are a small sheet metal job shop with about 45 employees (a job shop doesn't design/manufacture/sell its own products, but rather builds parts to customer specification in small, periodic batches. In our case, we cut, form, add hardware, powder coat, and print sheet metal). While we have an ERP system that provides reports of customer orders (jobs), we lacked an effective method for all employees to align on daily priorities, and view future and late orders because the ERP system required system access (most shop floor employees don't have accounts or access to computers), the canned reports are only up-to-date when printed, and the canned reports aren't customized to provide all the information necessary for employees to have complete job knowledge. Defined and implemented tagnets (magnets with a wet-erase writable side) with: Customer, Job#, Part Number, Quantity, and Due Date. Quite rapidly, the following information was also added: Special Process Codes (ex. Powder coating, silk screening), whether or not it was out-to-sub (OTS), whether it was a kanban item, etc. Each tagnet had to be handwritten, and once the job was shipped each one needed to be rinsed and dried...tagnets were a significant time sink. Furthermore, acquiring the ERP system information required to fill out the tagnets was time consuming, requiring multiple screens or reports with much exporting and clean up. The weekly effort to create, post, and clean the tagnets consumed at least 4-5 person-hours each week. We evaluated started with 6-10 potential electronic board solutions, all designed, like Kanban Tool, for project management, and we did the free trial on 3. Only Kanban Tool met our requirements for card and board settings (including using the various plug-ins), usability, and cost, so we purchased two licenses and set about developing our board and processes. Once we were confident that we were ready to go to a pilot phase, we purchased a 3rd license, and more recently a 4th since we've gone live. And, recent improvements in Kanban Tool's import capability have made the entire process very fast, reliable, and more automated (it takes only 3 minutes a week to run the ERP report, extract and clean up the data, and import it into Kanban Tool). Finally, we are able to quickly edit the board during our stand up meeting to change status (card color), edit information (such as quantities, due dates), assign actions, move cards between grid locations, or delete them, ensuring the board is up to date and reflects priorities and status visually to anyone passing by or viewing remotely. And the search and filter functions enable area leads to quickly locate jobs and filter for those specific to their area scheduled any time in the next two weeks. 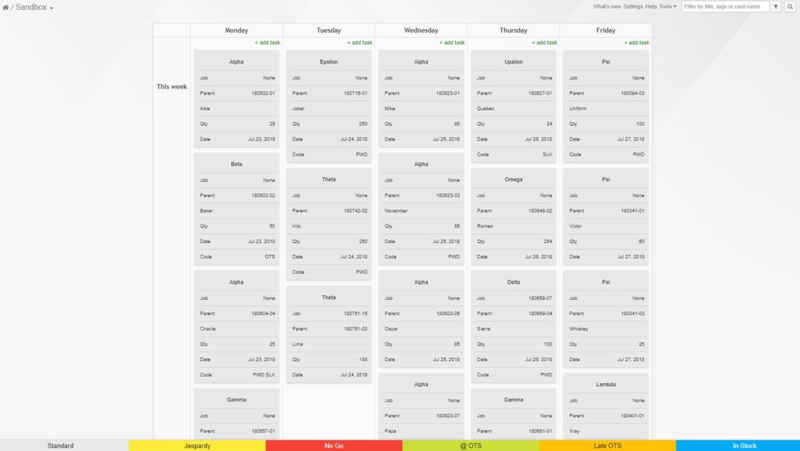 We manage a visual shop floor job board showing a 2-week window for scheduled shipments. In our implementation, each card represents a discrete customer job, and its location and color represents the job's requirements, current status and schedule. This permits users to see the daily work load, and whether jobs are on schedule, in jeopardy, late, or at sub-contractors. As a result, we don't flow the cards between columns or swim lanes, but place them based on due date, and move only occasionally between swim lanes. Allowed us to automate an existing process, not change a process to fit the tool.